Home › News & Articles › Reports › Verbeke Paul, "Aurillac 10 June 2006 - National winner with a small basket"
Verbeke Paul, "Aurillac 10 June 2006 - National winner with a small basket"
The national winner of Aurillac, Paul Verbeke from Gits, is a fancier which could be classified in the category “Small ones”. Paul has 31 pigeons in his loft (9 widowers, 9 hens and 13 youngsters). He proved once again that possession of hundreds of pigeons is not essential in order to gain national credit. “De Rode 276” was clocked just before 3PM and covered a distance of 676 kilometres at the average speed of 1380m/min. That Saturday afternoon, Paul was not even expecting “De Rode”. Together with his neighbours, he was watching Tours pigeons. Andre Bouckaert saw a flash going in the direction of Paul’s loft. It goes without saying that Paul was very happy when he realized that “De Rode” might have pulled off a real stunt. The pigeon still had to fly a training race for Barcelona but it is very much possible that this pigeon will never cross the sky of Gits again. Paul has had a lot of luck with his pigeons in fact. He could nearly not obtain any prize in 1998 and 1999. So it was necessary to get some new blood. He obtained about 15 youngsters from the late Michel Van Eecke (Langemark) at the end of the season. He had the “Decroix strain” from Rumbeke in his possession and raced extremely good. Paul raced the youngsters of these pigeons in 2001 for the first time and, immediately, he had 6 pigeons that could compete with the best. Furthermore, Paul has some pigeons of his neighbour Andre Bouckaert in his loft and birds from Odiel Vanneste in Rumbeke. Paul also has to thank Roger Lagae of course, a capital 85-year-old fellow. Roger is always happy to help when Paul and Agnes are away for a couple of days. 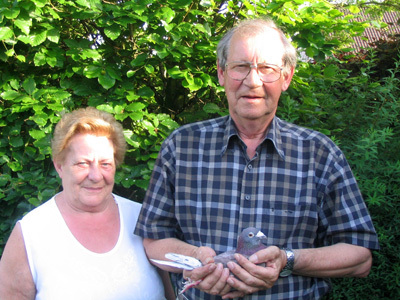 Paul is a retired teacher of 70 years old and he is racing pigeons since 1956. Initially, he played together with his father but when Paul got married in 1963 his wife preferred if he stayed home and suggested that he would start racing on his own. Paul has always given preference to extreme long distance races. Arras and Clermont are seldom or never basketed. To Paul, this national victory is his first, although... Paul once gave a young pigeon to Arsene Bonte (Gits) and he won the national race from Limoges with this bird a couple of years later.